While using a soap dispenser is aimed at making your hands cleaner, there is always the possibility of contracting dirt, germs, and bacteria in the course of pressing the pump. Due to such fears, many people opt for single-handed or automatic soap dispensers that allow dispensation of soap in an easier, more convenient and hygienic manner. This single-handed soap dispenser from HOMEPLUZ keeps the sink, kitchen, bathroom and laundry area clutter-free. The wall-mounted unit can be fixed using nails or adhesive and won’t fall off easily. It features a window that indicates the remaining volume while the one-handed design allows for quick release of soap and minimal contact. And to reduce wastage, each drop is pre-measured. 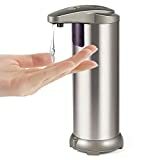 Washing your hands when in the kitchen or bathroom is relatively easy with the FQ soap dispenser. This automatic device comes with front infrared sensors that sense motion and will immediately release the right amount of soap. The unit relies on 4AAA batteries that last for a long time and to prevent entry of water or moisture, the dispenser comes with waterproof seal design. The stainless steel unit is not only strong and elegant but is also resistant to rust and corrosion. 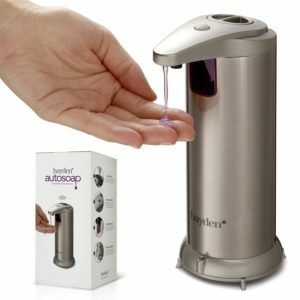 With a 280ml capacity, this soap dispenser can accommodate a large amount of soap. 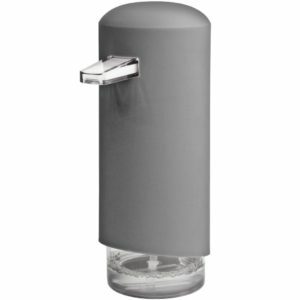 If you are looking for an attractive and reliable soap dispenser then you will love the Secura soap dispenser. 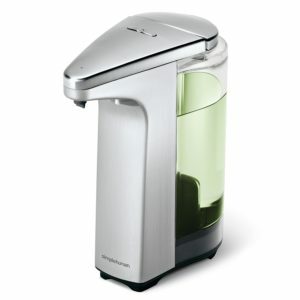 This automatic unit is battery powered and has a capacity of 17ounces/500ml. Soap release is activated by the infrared touch sensors that are sensitive as far as 2.75 inches and dispense 0.03 to 0.19 oz per session. The chrome and black dispenser can be mounted on the wall or placed on the counter and is known to retain its appeal for quite a long time. Unlike the usual soap dispensers that require you to use your palm or fingers when dispensing soap, the Joseph Joseph dispenser is activated using the back of the hand. 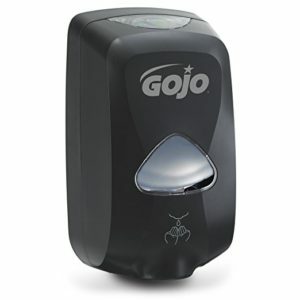 Simply put, you don’t touch any germs, bacteria or dirt that may have been left on the dispenser. It is designed for any kind of soap and also includes a level indicator for displaying the amount inside the container. The matte-finished product is not only attractive and hygienic but also comes with decent capacity. Dispensing soap from a container shouldn’t be a messy or unhygienic affair. This is more certain with this superhuman dispenser that features a stylish container for holding liquid soap and a sensitive sensor pump. The pump releases precise amount within 0.2 seconds of being activated while the non-drip silicone valve ensures no leaks occur. It comes with a magnetic lid that simplifies the processes of refilling soap or changing the batteries. 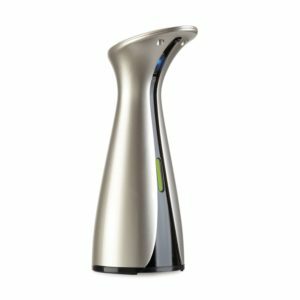 The sleek and stylish dispenser is perfect for the kitchen, bathroom, and other places. 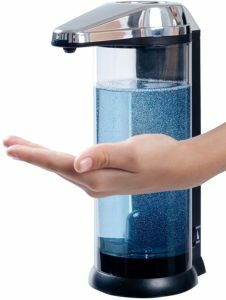 This dispenser measures 4 1/10 inches and can accommodate up to 1200ml of foam soap. It comes in a touch-free design to minimize contamination and also enhance hygiene. This is improved by its sensitive sensors that are located on its lower section. Although looking simple, this plastic unit scores well when it comes to reliability, accuracy, hygiene and is suitable for home and commercial use. Dispensing soap in a stress-free and hygienic manner is what the Umbra Otto guarantees a user. The 177ml/ 6 fluid ounce dispenser comes in a dimension of 8-3/4 x 4-1/4 x 3-3/4-inches and is fit for domestic and commercial uses. It automatically releases liquid soap after activating the sensor placed on the pump’s front. The unit is powered by four AAA batteries that offer service for up to one year. As the name implies, this soap dispenser allows you live better. 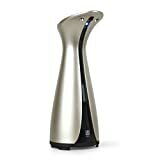 The trendy and modern-looking dispenser works with foam soap and is fit for the kitchen, bathroom, laundry room, home, office and other situations. It can accommodate up to 250ml/ 8.4 ounces of liquid soap and save up to 70% of the soap courtesy of being economical. Additionally, the foam soap dispenser is easy to maintain due to its simplistic and user-friendly nature. Soap will be released automatically in just 0.2 seconds after placing your hands near the infrared sensors. 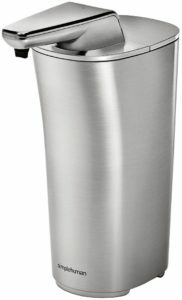 The Simplehuman Soap Dispenser has an 8 ounce capacity and features brushed nickel surface. It contains uniquely-designed gears and a powerful pump that releases soap quickly while the No-drip silicone valves prevent messy drips. The touch-free auto unit runs on 4 alkaline AA batteries that can last for up to one year whereas the easy-access volume control adjusts the amount dispensed. 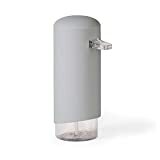 Minimize contact with dirty soap dispensers by installing the original Hayden Auto Soap. This automatic soap dispensing unit is suitable for residential and commercial purposes and works with any type of soap. It features a newly-improved waterproof base, fingerprint-resistant surface and brushed stainless steel. This Premium Automatic Touchless unit uses a smart-motion sensing infrared sensors that eliminate the need for contact and this keeps the hygiene standards high. The sleek, modern-looking unit comes with controls for varying the amount of soap dispensed. 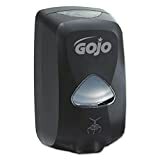 Worrying about touching dirty or contaminated soap dispensers with your hands will stop when you acquire the best single-handed or automatic dispensers. The right product will easily and quickly release the soap with minimal contact and effort and this assures you of top hygiene. After comparing varied items based on user friendliness, minimal contact, design, reliability, and elegance, we ascertained the above soap dispensers to be the best. They are well-designed, compact, and portable and suited for different locations. 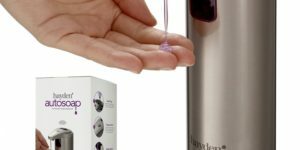 Following this top 10 best c-pump single-handed soap dispenser in 2019 review not only helps you choose the best product but also guarantees you of top hygiene and peace-of-mind while using the product.